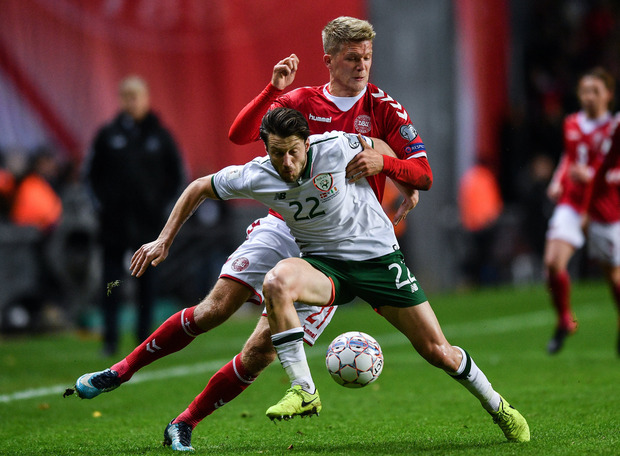 Harry Arter declared ‘the World Cup feels close’ after Ireland played out a dour 0-0 draw against Denmark in Copenhagen. Bournemouth midfielder Arter turned in a tireless performance as he filled in for the suspended David Meyler in the holding role, with the cramp he was suffering with in the closing stages evidence of the effort he had put into the game. Now Arter is eyeing up a big night at Dublin’s Aviva Stadium, as he suggested Ireland need to take the glorious chance they have created for themselves to qualify for Russia 2018. “Before the campaign, if we were offered a chance to win a one-off game against Denmark at home, we’d have bitten your hand off. Now we have to take it,” declared Arter. “I think away from home, a draw has got to be seen as a positive result. In an ideal world, you want to score an away goal, but to come over here and keep them at bay was a good effort. Arter won praise from former Ireland midfielder Keith Andrews, who suggested his performance was crucial to the Irish effort in Copenhagen. “It was a very disciplined performance from Harry Arter,” Andrews told Sky Sports. “I looked at the team sheet and it wasn’t obvious who would fill in for David Meyler, but Arter did a fine job in there. “A draw is a decent result and now we need to show more going forward. We need to get that stadium in Dublin rocking and we are close to the World Cup now. “We need to get further up the field now, but that does not mean we need to be open an expansive, as some fans want to see.